On Thursday Estudiantes played against Nacional de Montevideo for the semi-finals of the Copa Libertadores (equivalent in South America of the Champions League). After a very bitter negotiation between the two clubs as to how many tickets should be given to the away fans ended in failure, it was decided that the games would be played without away fans. The main reason for this was that Estudiantes asked for 12 000 tickets in Montevideo (which they even offered to pay at the, for South America, incredible price of 30 USD each…in advance! ), but were finally granted only 3 000. In order to avoid dangerous situations (riots, disturbances, robberies, killings, shooutouts, you name it) trying to sell so few tickets with such a huge demand, the CoProSeDe (responsible for „safety“ in Arg. 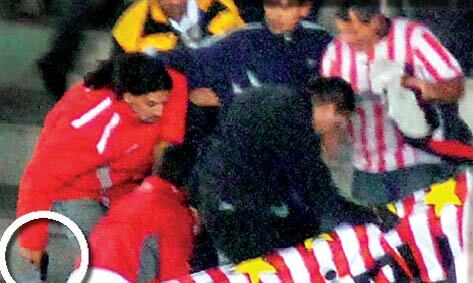 stadiums outside of Buenos Aires) even threatened to not provide police officers for the selling of the tickets. This also had the side effect of reducing the risk of the games, as Estudiantes barras are friends with those of Penarol, who in turn are the worst enemies of Nacional. Cup semi-final, no away fans, 40 000 people in a sold out stadium, 1-0 victory…the unsuspecting outsider believes that all goes well? Far from it! In a new episode of inter barrabrava conflict, one faction of the Estudiantes barra decided it was time to convey a clear message to the other. As you see in the picture above…the message doesnt need much explaining! Long story short…in the stadium, during the game, not only was this gun pulled out…the intended victim was indeed shot. At least they were kind enough to shoot the guy in the leg. The highlight of the day was however delivered by the police chief in charge of the game, who declared after the game that „there were no particular incidents, and all went smoothly.“ Needless to say, nobody was arrested. Its already over two years since the scandalous decision to forbid away fans from Argentine lower division games (all divisions expect first). This decision was a desperate attempt on behalf of the AFA and state authorities to stop the somewhat out of control weekly football violence. Too bad for them that the first division teams do a more than good enough job of keeping the scandal quota high, and they dont even need rival fans to achieve it!